Home / Local / News / Video / Tama Bang Pinutulan ng Ari ang Lalaking ito Matapos malaman ng kanyang Misis ang Kanyang Pambababae? Panoorin! 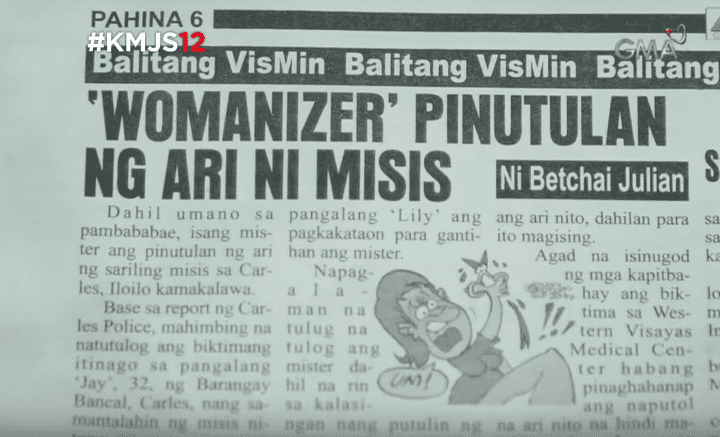 Tama Bang Pinutulan ng Ari ang Lalaking ito Matapos malaman ng kanyang Misis ang Kanyang Pambababae? Panoorin! Jealousy destroys relationships but in reality, infidelity is the real culprit for break ups. Take this couple for example. They became the talk of the town in Carles, Iloilo after the wife supposedly cut off her husband's organ. Believing that this was the root of their problem, "Baby" took matters to her own hands. This viral story was caught by "Kapuso Mo Jessica Soho", a local magazine show in the Philippines. They conducted an in depth investigation about the said incident to figure out what really happened. In KMJS, Baby revealed that one night, after drinking out with friends, Baby suddenly woke up with a heavy heart. She was bothered by several thoughts in her head and for some reason, she believed that her problem was all because of her husband, and his insatiable organ. With one snip of a pair of scissors, Baby permanently removed her husband's organ. According to Baby, everything started way before that fateful night. Back in 2001, the two met at a bar where Baby worked. Rick, her husband was a customer at that bar. 2 years later, the two married and had 3 kids. However, years past and she felt that Rick was no longer the man she fell in love with. She keeps catching Rick with sweet messages from different women. Some concerned neighbors and friends also confide to Baby and tell her what's been going on. Plus, Rick never gives his whole salary for Baby to budget and he never gets home on time. Baby confronted her husband about the whole affair, but Rick vehemently denied all claims. But everything went downhill after Baby learned that Rick not only had one mistress-- but five! Aside from the 5 women, Baby learned that Rick was even canoodling with her sister. All those unfortunate events pushed Baby to the point of destruction where she is now. Her husband's organ did not survive the tragedy but was able to undergo surgery where his urinary tract will be diverted so he can still relieve himself. As for Baby, she is detained at the municipal prison of Carles, Iloilo. Once Rick got out of the hospital, he defended himself and said that Baby was just really overly jealous and he never cheated on his wife. What do you think? Do you believe in Rick? Was Baby's actions justifiable? Tell us in the comments section below!